Intestate - Intestacy rules - Who inherits if there is no will? Intestate – Intestacy rules – Who inherits if there is no will? Intestate has generally if a person who has died without having made a will. Who inherits if a person died intestate and without a will? A person who died in Intestate. Only married or civil partners and some other close relatives can inherit under the rules of intestacy. The estate must be shared out according to certain rules, called the rules of intestacy. In England and Wales, there is a statutory set of rules, the rules are different in Scotland. The estate of such a person will undergo Administration instead of Probate. What’s the threshold if a person died in intestate? Who gets what as per rules of intestacy? When a person died intestate, his spouse would receive £250,000 of the assets with the rest being split equally between his wife and children. Within the United Kingdom legal profession, the term Testator (sometimes referred to as Testatrix in the female form) is typically used to describe a person who has, prior to their death, written and executed a last Will and testament. Similarly, Testacy (or being Testate) describes the status of being a Testator. The estate (property, savings, possessions etc.) of such a person will go through the Probate process in order to distribute assets to the beneficiaries of the Will. Conversely, a person who dies without having made a Will can be described as being Intestate. In the UK, Under the Administration of Estates Act 1925 (AEA 1925), intestacy rules (sometimes known as the law of descent and distribution) refers to the body of law which determines who is rightfully entitled to inherit the estate (property, savings, possessions etc.) of a deceased person under the rules of intestacy. Intestacy Rules are intended to make fair provision for a dependent spouse or other relatives in the event of the death of the person upon whom they were dependent. Call 0845 218 0233 to make a claim with zero financial risk or alternatively complete the form opposite and we will contact you in cases of intestacy rules. Should none of the above relatives be identifiable, the order of priority is extended to the more remote degrees of kinship. What happens when a person dies in intestate? In England and Wales, if the deceased’s estate is valued below a certain threshold, the estate in its entirety will be inherited by any spouse or civil partner of the deceased. Such inheritances (below the threshold) are currently exempt from UK inheritance tax. Any surviving children (or more distant relatives if there are none) will be entitled to a percentage of the estate. This is typically disbursed to them in two halves – The first immediately and the remaining half when the surviving spouse passes away. In circumstances where a person dies intestate with no identifiable heirs and no beneficiaries can be traced, the law of Bona Vacantia applies. In such cases, the deceased’s estate generally escheats to the Crown (or to the Duchies of Cornwall or Lancaster if the deceased was a resident of either county). Who Manages the Process in cases of intestate? When somebody dies Intestate, an Administrator (or Administratrix if female) will be appointed by the Probate Division of the High Court of Justice or the local District Probate Registry in order to act as the personal representative of the deceased. The Administrator could, for example, be a relative, family friend or even an otherwise unconnected creditor of the deceased. Should a creditor of the deceased claim and obtain a Grant of Administration then the court compel them to establish a bond with a minimum of two sureties attesting that their own debt will not receive preferential treatment over those of other creditors. Under the Intestacy Rules, in situations whereby a minor (child under 18 years old) would inherit, or a life interest would arise, the Court or District Probate Registry would typically appoint two or more Administrators. Are there Different Rules in Scotland? In Scottish law, the Intestacy Rules broadly follow those of England and Wales with some small variations. The main difference being that all possible blood relatives are eligible to qualify for a mandatory inheritance. Where no blood relatives can be traced, the estate will pass in its entirety to the Crown under the law of Ultimus Haeres. 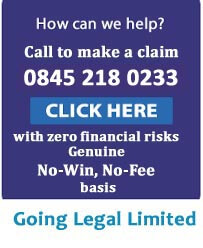 Call 0845 218 0233 to make a claim with zero financial risk or alternatively complete the form opposite and we will contact you. Going Legal is ready to assist you in bringing a claim by introducing you to an experienced solicitor who will act for you on a genuine no-win, no-fee basis. The intestate law is complex and requires experience and knowledge in order to navigate it successfully. Our expert specialists will quickly be able to evaluate your case, guide you through the process and introduce you to an experienced solicitor who will work for you on a genuine No-Win, No-Fee basis. 2. What are the rules of intestacy? 3. Who would receive an inheritance under the rules of intestacy? 4. What does dying intestate actually mean for you? 5. Who gets my money if I die in intestate? 6. Can the intestacy rules be challenged? 8. In what situation will my estate go to the government? 9. how changes to the intestacy rules affect you? Call 0845 218 0233 to make a claim with zero financial risks or alternatively complete the form opposite and we will contact you in cases of intestacy rules. Copyright © 2014 - 2019 Going Legal Ltd. All rights reserved. This website is one of the UK's largest Wills and Probate No Win No Fee support centres. It is operated by Going Legal Ltd. The UK Registered company number 3785951. Going Legal is not a solicitors practice. Going Legal Ltd is regulated by the Claims Management Regulator in respect of regulated claims management activities (Authorisation Number: CRM19983). The legal services on this site are provided by selected Solicitors and law firms that are registered with the law society and regulated by the Solicitors Regulation Authority to whom you will be introduced if your claim has sufficient merit.